Can Medication Help Me Feel Better? The use of medication in treating vestibular disorders depends on whether the vestibular system dysfunction is in an initial or acute phase (lasting up to 5 days) or chronic phase (ongoing). During the acute phase, and when other illnesses have been ruled out, medications that may be prescribed include vestibular suppressants to reduce motion sickness or anti-emetics to reduce nausea. Vestibular suppressants include three general drug classes: anticholinergics, antihistamines, and benzodiazepines. Examples of vestibular suppressants are meclizine and dimenhydinate (antihistamine-anticholinergics) and lorazepam and diazepam (benzodiazepines). Other medications that may be prescribed are steroids (e.g., prednisone), antiviral drugs (e.g., acyclovir), or antibiotics (e.g., amoxicillin) if a middle ear infection is present. If nausea has been severe enough to cause excessive dehydration, intravenous fluids may be given. During the chronic phase, symptoms must be actively experienced without interference in order for the brain to adjust, a process called vestibular compensation. Any medication that makes the brain sleepy, including all vestibular suppressants, can slow down or stop the process of compensation. Therefore, they are often not appropriate for long-term use. Physicians generally find that most patients who fail to compensate are either strictly avoiding certain movements, using vestibular suppressants daily, or both. Vertigo and dizziness are among the most common complaints, having a lifetime prevalence of about 30%1. They are symptoms of a variety of disorders that involve the peripheral (otologic vertigo) and/or the central vestibular (brain-induced vertigo) systems. These produce asymmetric input into the central vestibular apparatus or asymmetrical central processing. If this process is acute, vertigo, nausea and vomiting may result. If it is more chronic, dizziness and/or disequilibrium may be the manifest symptoms. Surgical treatments - in less frequent lesions such as semicircular canal dehiscence, where there is a lack of bone covering one or more semicircular canals and ear tumors (e.g. vestibular schwannoma); some drugs (namely gentamicin and dexamethasone) may also be applied transtympanically as a simple procedure under topical anesthesia. With this paper we aim to introduce the reader to the complexity of decision-making when treating vestibular disorders, as well as to analyze the most used pharmacologic strategies for the most common etiologies of vertigo and dizziness. While vestibular diagnosis has tremendously evolved with the development of new instruments – vHIT (video Head Impulse Test) and VEMP (vestibular evoked myogenic potentials), just to mention a few examples – the treatment of vestibular pathology has undergone many changes not so much by the discovery of new medications, but rather by the use of medications originally used for non-vestibular pathologies. Many of these drugs are still used in off-label manners (i.e., are used in a way not specified in the FDA's approved label). This is because only a few medications have proven, in controlled trials, to be effective. As in all cases and particularly with these drugs, patients should therefore be informed before starting treatment of the balance between risks and benefits. The prerequisites for successful pharmacological treatment of vertigo and dizziness are the “4 D’s”2: correct diagnosis, correct drug, appropriate dosage and sufficient duration (Table 2). Is there vertigo or dizziness? With vertigo the patient will have a sensation of false or distorted self-motion. Are the patient’s symptoms spontaneous or triggered (e.g., by head movement or position changes)? How long has the patient had symptoms, and how often do they occur? When did symptoms first begin? Are there accompanying symptoms, namely ear symptoms or neurological symptoms? Clinical examination is also mandatory for diagnosis and should be carried out in every patient. Eye movement evaluation is one of the major windows in this respect because particular eye movements are evoked by particular vestibular conditions. A precise and brief neurological and otological examination should also be conducted. Treatment is dictated by the patient’s diagnosis. The use of medication for the treatment of vestibular disorders may be directed to treat the etiology, control the symptoms, accelerate central compensation or diminish the psychological comorbidity that often accompanies the syndrome (Table 3). Vertigo is the illusion of rotational motion. Most vertigo with definable cause is otologic, caused by dysfunction of the labyrinth in the inner ear. Normal persons continuously process three types of sensory input: visual, vestibular (inner ear) and somatosensory (sense for position and movement of body parts) to estimate the orientation and motion of the head and body. Physiologic and pathologic vertigo is caused by asymmetric input into the central vestibular apparatus or asymmetrical central processing. Many pathways and neurotransmitters are involved in causing the vertigo and autonomic complaints. This explains why so many classes of drugs are used in the management of this disorder. Occasionally in some oculomotor disturbances accompanied by nystagmus (rhythmic and involuntary eye movement) the patient can feel oscillopsia: the illusion that the world is jumping or swinging back and forth. There are some medications to diminish this disabling symptom and improve the visual support (e.g. clonazepam for certain cerebellar induced nystagmus). In addition to the symptom of vertigo, motion sickness (the malaise and nausea which may follow real or illusory sensations of motion) should also be considered. Vertigo and motion sickness are not synonymous. For example, reading in a moving car may, in susceptible persons, induce nausea and autonomic symptoms but not the false sensation of self-motion. Clinically, treatment options for patients with vertigo include symptomatic, specific and prophylactic approaches. Symptomatic treatment involves controlling the acute symptoms and autonomic complaints (e.g., vertigo and vomiting). Specific treatment involves targeting the underlying cause of the vertigo (e.g., ear infection). Prophylactic treatment aims to reduce the recurrence of specific vertiginous conditions, as in Ménière’s disease, migrainous vertigo or vestibular paroxysmia. Symptomatic control involves managing the acute symptoms and autonomic complaints (e.g., vertigo and vomiting). There is a connection between the part of the brain involved in vomiting and the vestibular system. If the vestibular system is strongly stimulated, either by real motion or by vertigo, the vomit center becomes active and nausea and vomiting occurs. Nausea and vomiting can be even more stressful than vertigo itself, therefore being one of the main targets for pharmacological treatment. Other associated symptoms named “autonomic symptoms” are pallor, swelling, salivation, diarrhea and abdominal distention. Vestibular suppressants are drugs that reduce the intensity of vertigo and nystagmus evoked by a vestibular imbalance. These also reduce the associated motion sensitivity and motion sickness. Conventional vestibular suppressants consist of three major drug groups: anticholinergics, antihistamines and benzodiazepines. Diazepam (Valium®), clonazepam, lorazepam and alprazolam are benzodiazepines commonly prescribed for their effect as anxiolytics and antidepressants. These drugs also act as vestibular suppressants and can, in small dosages, be extremely useful for the management of acute vertigo3. They are also useful in controlling motion sickness4 and can also minimize anxiety and panic associated with vertigo. Habituation, impaired memory, increased risk of falling and vestibular compensation are potential side effects. Their use as vestibular suppressants should therefore be limited in time. Nevertheless, they should not be stopped suddenly because of potential withdrawal syndrome. Antihistamines include meclizine (Antivert®), dimenhydrinate, diphenhydramine (Benadryl®) and promethazine. These drugs can prevent motion sickness and reduce the severity of symptoms even if taken after the onset of symptoms5. Dry mouth and blurry vision are side effects that result from their anticholinergic action. Anticholinergics are vestibular suppressants that inhibit firing in vestibular nucleus neurons6 as well as reduce the velocity of vestibular nystagmus in humans. The most effective single anticholinergic drug for the prophylaxis and treatment of motion sickness is scopolamine. All anticholinergics conventionally used in the management of vertigo or motion sickness have prominent side effects, often including dry mouth, dilated pupils and sedation. Antiemetics are drugs that are commonly used to control vomiting and nausea. The choice for vertiginous patients depends upon the route of administration and the side effect profile. Injectables are mostly used in the emergency room or inpatient settings. Dexamethasone (Decadron®) and ondansetron (Zofran®) are powerful and well-established inpatient-setting antiemetics. While not FDA approved, droperidol (Droleptan®) is widely used outside the U.S. The oral agents are only used for mild nausea, with sublingual administration preferable for outpatients. When an oral agent is appropriate, meclizine or dimenhidrinate (Dramamine®), antihistamines commonly used also as vestibular suppressants, are generally the first to be used because they rarely cause adverse effects any more severe than drowsiness. Phenothiazines, such as prochlorperazine (Compazine) and promethazine (Phenameth®, Phenergan®), are also effective antiemetics but side effects include sedation and the possibility of extrapyramidal symptoms (dystonia and Parkinsonism). Drugs that speed gastric emptying, such as metoclopramide (Reglan®) and Domperidone may also be helpful in managing vomiting7. Vestibular neuritis is the most common cause for acute vestibular syndrome (acute vertigo with acute nystagmus). Although it is believed to be caused by the reactivation of a virus (Herpes simplex virus: type 1) in the vestibular nerve (vestibular neuritis), it does not benefit from antiviral treatment but rather from methylprednisolone (Medrol®), a corticosteriod. In fact, this drug alone has proven to significantly improve the recovery of peripheral vestibular function in patients with vestibular neuritis8. Symptomatic treatment should also be provided in the first days (see section 2. Symptomatic control: vestibular suppressants and antiemetics). In the emergency room Dexamethasone, also a corticoid, may be particularly useful for both its anti-emetic and anti-inflammatory properties. Treatment with vestibular suppressors should be discontinued once the acute symptoms are controlled; chronic treatment with these drugs is discouraged to prevent the inadequate compensation. Vestibular rehabilitation has shown to be most effective strategy in reaching complete clinical recovery9. This long-ignored condition is currently recognized as one of the most common causes for vertigo and dizziness. A number of criteria have to be addressed, but simplistically both migraine and vertigo or dizziness must be related in time in order to diagnose this condition. The treatment includes trigger avoidance, pharmacotherapy and vestibular rehabilitation. For acute attacks only symptomatic control is eventually effective (see section 2. Symptomatic control: vestibular suppressants and antiemetics) as migraine abortive agents such as triptans have reached inconclusive results. Prophylactic treatment protocols are based on the ones from migraine headache, and include β-blockers such as propranolol or metoprolol; calcium-channel blockers such as verapamil, antidepressants such as amitriptyline, fluoxetine, or venlafaxine10; anticonvulsants such as valproate or topiramate, and carbonic anhydrase inhibitors such as acetazolamide. Ménière's disease is the second most common cause of vertigo of otologic origin and is classically attributed to dilation and periodic rupture of the endolymphatic compartment of the inner ear. The pathognomonic symptoms include episodic vertigo, ipsilateral fluctuating hearing loss, aural fullness and tinnitus11. The treatment should therefore address these symptoms, i.e. stop vertigo attacks, abolish tinnitus and reverse or preserve the hearing loss. Clinically the pharmacological treatment is addressed at the acute episode management, prevention of new attacks and the treatment of audio-vestibular dysfunction. There is no consensus on prophylaxis of Ménière's syndrome, with major differences between the U.S. and Europe regarding whether betahistine offers therapeutic benefits (see prevention of attack). The treatment during the attack is symptomatic and similar to other etiologies of spontaneous vertigo, with vestibular suppressors and antiemetics being the most appropriated strategies. Irrespective of the prophylactic treatment used, remission may eventually occur in 60% to 80% of cases12-13. At start, patients should follow dietary salt restriction (1-2 gram salt diet) and adequate hydration (35 ml/kg of liquids). Patients should also avoid caffeine and stop smoking. If the patient does not achieve a good control of symptoms by following this regimen, a mild diuretic, such as Dyazide® or Maxide® (hydrochlorothiazide-triamterene), may reduce the frequency of attacks14. It should be noted that diuretics may cause significant hyponatremia and low blood pressure, especially in the elderly and in those who are already on salt-restricted diets. This treatment with betahistine regimen is widespread worldwide, with a survey in England reporting that 94% of ENT surgeons prescribe betahistine to their Ménière's patients14. 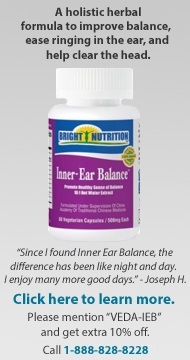 The underlying mode of action is believed to be through increased inner-ear blood flow, with local vasodilation and increased permeability, thereby relieving pressure from the inner ear. A long-term high-dose treatment with betahistine (at least 48 mg three times daily), has shown a significant effect on the frequency of the attacks15. Some patients also respond well to corticoids. Studies on transtympanic steroids have shown evidence of good preservation of hearing and tinnitus control with substantial decrease in the number of vertigo spells16. Before considering nonconservative measures, using transtympanic steroids could be a good approach in patients refractory to betahistine, those with bilateral Ménière’s and those with relatively good hearing in the affected ear. Patients with Ménière’s disease may become disabled by recurrent vertigo; in this situation surgical treatment to inactivate all or part of the labyrinth could correctly be indicated. In recent years, Ménière’s treatment has been revolutionized by the use of transtympanic “low-dose gentamicin.” In 1997, Driscoll reported that a single dose of gentamicin through the eardrum eliminated recurrent vertigo in 84% of his patients17. This procedure has made it possible to control vertigo after other drug treatments have failed. There is not much evidence that treatment of chronic audio-vestibular dysfunction prevents further progression of hearing loss. Hearing aids and vestibular rehabilitation could be indicated. Vestibular paroxysmia is believed to be caused by the neurovascular compression of the cochleovestibular nerve, as it occurs with other neurovascular compression syndromes (e.g. trigeminal neuralgia). The irregular and unpredictable spells are the most disabling aspect of this condition, making some daily activities, like driving, extremely dangerous. In theory, given its pathophysiology, surgical treatment could be considered. Still, due to the substantial surgical risks involved, this approach is reserved for particular cases where pharmacological treatment is not effective or tolerated. Treatment with carbamazepine (Tegretol®) or oxcarbamazepine (Trileptal®), both anticonvulsants primarily used in the treatment of epilepsy, is usually not only effective in small dosages, but is also diagnostic. Vestibular depressants are not effective. Together with physical therapy and lifestyle changes, the pharmacological approach is one of the three pillars for vestibular disorder treatment. The use of medication in each case comes from a proper assessment of symptoms, severity of disease and side effects. Vestibular suppressants should only be used in acute cases to alleviate the stressful symptoms because prolonged use may generate a chronic vestibular imbalance. Preventive medications generally do not cure the underlying disease but may decrease or abolish the number of attacks of vertigo and dizziness. Most of the drugs used for vertigo treatment act specifically on certain receptors or ion channels, but there are several neurotransmitters and pathways involved in causing the vertigo and autonomic complaints. The knowledge of some of these pathways and drug mechanisms has enabled recent advances in the treatment of specific vestibular disorders, such as vestibular migraine, vestibular paroxysmia or some central nystagmus. Still, the main focus should be kept on establishing a correct diagnosis, then developing an effective treatment regime, for patients suffering from vertigo and dizziness. Click here to download "Pharmacological Treatments for Vestibular Disorders." Neuhauser HK. Epidemiology of vertigo. Curr Opin Neurol. 2007;20(1):40-46. Strupp M, Thurtell MJ, Shaikh AG, et al. Pharmacotherapy of vestibular and ocular motor disorders, including nystagmus. J Neurol. 2011;258(7):1207-1222. Hain TC, Yacovino D. Pharmacologic treatment of persons with dizziness. Neurol Clin. 2005;23(3):831-853, vii. McClure JA, Lycett P, Baskerville JC. Diazepam as an anti-motion sickness drug. J Otolaryngol. 1982;11(4):253-259. Takeda N, Morita M, Hasegawa S, Kubo T, Matsunaga T. Neurochemical mechanisms of motion sickness. Am J Otolaryngol. 1989;10(5):351-359. Kirsten EB, Schoener EP. Action of anticholinergic and related agents on single vestibular neurones. Neuropharmacology. 1973;12(12):1167-1177. Grontved A, Brask T, Kambskard J, Hentzer E. Ginger root against seasickness. A controlled trial on the open sea. Acta Otolaryngol. 1988;105(1-2):45-49. Strupp M, Zingler VC, Arbusow V, et al. Methylprednisolone, valacyclovir, or the combination for vestibular neuritis. N Engl J Med. 2004;351(4):354-361. Whitney SL, Rossi MM. Efficacy of vestibular rehabilitation. Otolaryngol Clin North Am. 2000;33(3):659-672. Cherchi M, Hain TC. Migraine-associated vertigo. Otolaryngol Clin North Am. 2011;44(2):367-375, viii-ix. Equilibrium CoHa. Committee on Hearing and Equilibrium guidelines for the diagnosis and evaluation of therapy in Ménière's disease. Otolaryngol-HNS. 1995;113:181-185. Torok N. Old and new in Ménière disease. Laryngoscope. 1977;87(11):1870-1877. Ruckenstein MJ, Rutka JA, Hawke M. The treatment of Ménière's disease: Torok revisited. Laryngoscope. 1991;101(2):211-218. Smith WK, Sankar V, Pfleiderer AG. A national survey amongst UK otolaryngologists regarding the treatment of Ménière's disease. J Laryngol Otol. 2005;119(2):102-105. Strupp M, Hupert D, Frenzel C, et al. Long-term prophylactic treatment of attacks of vertigo in Ménière's disease—comparison of a high with a low dosage of betahistine in an open trial. Acta Otolaryngol. 2008;128(5):520-524. Herraiz C, Plaza G, Aparicio JM, et al. Transtympanic steroids for Ménière's disease. Otol Neurotol. 2010;31(1):162-167. Driscoll CL, Kasperbauer JL, Facer GW, Harner SG, Beatty CW. Low-dose intratympanic gentamicin and the treatment of Ménière's disease: preliminary results. Laryngoscope. 1997;107(1):83-89.